Potato growers are being urged to keep a close eye on crops for signs of late blight (Phytopthora infestans) despite the recent dry weather seemingly acting to keep the disease at bay. The advice is particularly relevant to the growers using irrigation as the warm temperatures and higher relative humidity will combine to create conditions in the lower proportion of the canopy that favour disease sporulation and infection. “Above the canopy and certainly from the sprayer tractor seat, crops look largely free of disease, but don’t think we’re out of the woods yet. Conditions will change so ensure crops are suitably protected in readiness,” says Greg Dawson of Scottish Agronomy. Thoughts must now shift to tuber blight protection, so it is on the lower stems and haulm where growers need to focus their attention. As tubers form they become vulnerable to infection from sporangia and zoospores washing into the soil. Aerially dispersed sporangia or zoospores may directly infect the stem, usually at leaf axils. 30-40,000 spores per cm2 of lesion can lead to billons of spores being spread locally from poorly controlled blight or inoculum sources. 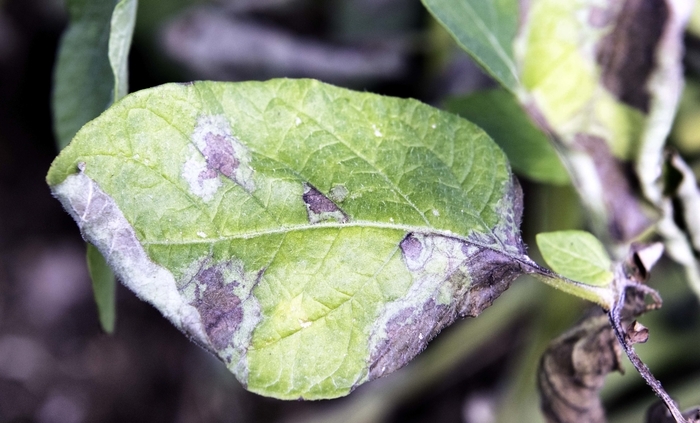 Fungicides reduce the potential of blight lesions to infect crops by cutting the number of sporangiophore formed post-application and while simultaneously decreasing the viability of those already formed. “These are the primary sources of inoculum for tuber blight and if growers are to avoid a repeat of the heavy store losses seen in recent seasons they need to shift to products with recognised anti-sporulant activity,” he says. Reports of blight to the AHDB Potatoes Blight Watch service have so far focussed on the Midlands, south west and south east of England, Pembrokeshire in Wales and Jersey. In contrast, Hutton Criteria warnings have been issued for most regions of the UK indicating that the potential infection risk is high. “That we have confirmed cases of blight in regions for which Hutton Criteria have not been met highlights both the aggressiveness of the dominant strains and the fact that pressure is often highly local, even within a field,” says Mr Dawson. This raises the importance of regularly inspecting crops for signs of disease rather than solely relying on warnings from synoptic or in-field weather stations, he says. Solar radiance is a critically important, but understudied factor determining the success of aerial dispersal that drives late blight epidemics. The spread of pathogen inoculum to uninfected potato fields is critical to epidemic development. Wind, atmospheric turbulence, temperature, humidity and solar radiation all play major roles in the aerial transport of spores. For example, modelling shows mean spore dispersal distance could well be over 800m on a windy, dull overcast day but only 120m on a calm sunny day. “Once conditions change, it could spread rapidly unless growers keep to schedules. While dry conditions continue, most are able to do so with relative ease,” says Mr Dawson. Experienced growers know to keep to standard intervals, especially when irrigating, but when the threat is perceived to be low it can be tempting to cut back on application rates or extend spray intervals. “This is a high-risk strategy with a big downside versus the potential gains,” he says. As crops move through flowering, focus shifts to protecting against tuber blight. Previously, growers have relied on fluazinam in rotation with Infinito and other products, but the emergence of 37_A2 (Dark Green 37) with acknowledged insensitivity to fluazinam removes a popular product at a crucial stage. “Fluazinam was a useful product, but as growers have no way of knowing exactly which strain of the disease they have in the field, continuing to use it leaves crops at risk and will only enable Dark Green 37 to spread further,” says Mr Dawson. “Because of how growers use products during the earlier stages of the season, the most suitable products available in practice are Infinito – which is the only product available containing fluopicolide which is highly effective against zoospores – and Ranman Top,” says Mr Dawson. Ed Hagues, Bayer root crops campaign manager, highlights that of the products favoured in the latter stages of the season, Infinito provides the best combination of foliar and tuber blight control with no need to tank-mix and is an important part of a robust resistance management strategy. “The fluopicolide in Infinito has a unique mode of action for tuber blight control while both it and propamocarb belong to different mode of action resistance groups thereby supporting an anti-resistance strategy,” says Mr Hagues. Rotate modes of action with known anti-sporulant activity once crops reach stable canopy. With the effective loss of fluazinam only two modes of action – Quinone inside inhibitors (Qil) and benzamides – remain with good activity against zoospores and therefore tuber blight. Product examples include: Infinito (fluopicolide + propamocarb), Ranman Top (cyazofamid) and Shinkon or Gachinco (amisulbrom). Keep to seven-day intervals. Don’t be tempted to extend intervals, if conditions change crops will be heavily exposed. “Once disease is established, the only option is to desiccate the affected areas,” he says. Monitor crops closely and look below the upper canopy. Disease on the stem and lower haulm is the real threat. The canopy may look clean of disease, but humid conditions mean disease could be festering below the canopy surface. Don’t be tempted to use fluazinam at the end of the season. “The arrival of 37_A2 with reduced sensitivity to fluazinam means it is effectively lost as a blight fungicide,” says Mr Dawson.